Place 1.5L (6 cups) of water and the sliced lemon into a medium saucepan and bring to the boil. Add salmon, cover and remove pan from heat. Set aside to poach for 10 minutes, or until salmon is cooked to your liking. Roughly flake salmon into large pieces with a knife and fork. Meanwhile, cook the pasta according to packet instructions, or until al dente, adding the sugar snaps, asparagus and snow peas in the last minute of cooking time. Refresh the pasta and vegetables under cold running water. Drain well. 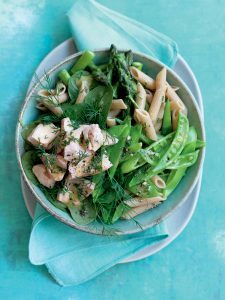 Combine the pasta, veggies, salmon, chopped dill and baby spinach in a large salad bowl. Whisk the mustard, grated ginger, lemon juice, olive oil and honey together in a small bowl. Add to the pasta salad and toss to combine. Season with cracked black pepper and garnish with dill. Serve.